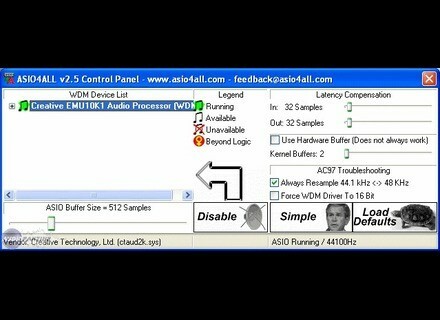 Asio4All [Freeware], Other Music Software from Michael Tippach. No problem whatsoever, the instructions are clear enough. Whatever your setup, if you don't have a good, ASIO-compatible soundcard with stable drivers you will NEED this if you want to work properly on anything computer-music related. No stability problem , the result is really satisfying provided you take the time to set the ASIO buffer & latency compensation values correctly. I've never yet owned a good sound card but thanks to ASIO4ALL I've always managed to work properly on computer music programs (over the years: Magix Music Studio, Tracktion, Kristal, Audacity, Cubase Studio 4) with basic, AC97 sound cards. I don't use the inputs though, so in this kind of use there may be a little more lag problems, but for arranging/mixing VST instruments and audio tracks recorded externally this proves very efficient. Amok_'s review (This content has been automatically translated from French)" Super top"
4ms latency, much better than my sound card! I just try it, works nickel in my config with a sound card base with no saturation in the ProKeys usb ........... essential free product with a master keyboard and no need for expensive sound card with MIDI (I can not believe this is even better!). Thank you to the creator! Bravo for the ct humorous symbol of the simple mode. Jobtiens 7 ms latency with the audio chipset motherboard, an AMD 64 3000 + 1.8 GHZ. ASIO4ALL + + Virtual Midi Keyboard MIDI YOYE = Gnial to try computer music by computer music for beginners, for the computer music on a laptop, etc.